Pest controllers – we need your wasps! ‘Why fly half way across the world to Trinidad when there are plenty of wasps drowning in my lemonade in Peckham?’ was a fairly reasonable question I was asked by a friend. 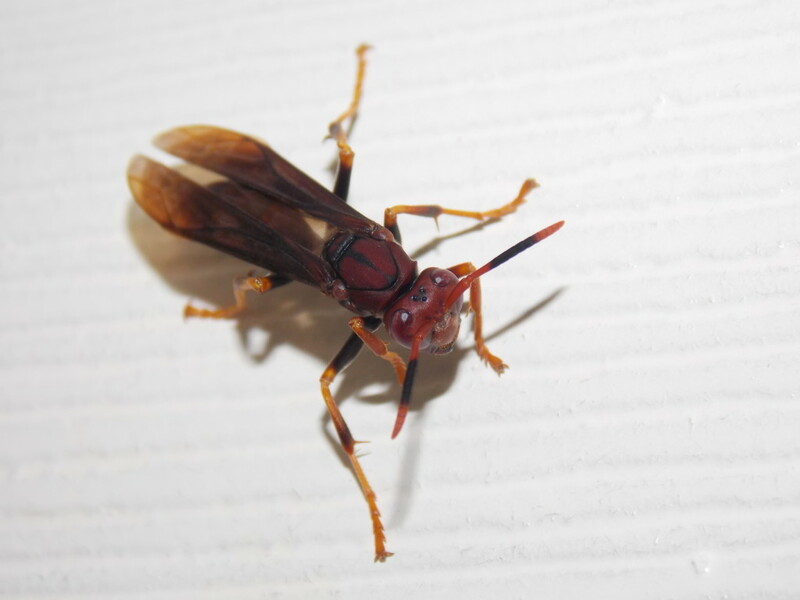 Trinidad may not initially seem a prime location for conducting field work, yet it is one of the regions with the greatest diversity of social Hymenoptera species in the world; with wasps ranging from the Tarantula Hawk Wasp, to the rather less fearsome Potter wasp. However, more importantly than the variety of aggression, is the variety in complexity of social structure; particularly the representatives from the less well studied ‘primitively eusocial’ species, which have little morphological and much more flexible caste-differentiation. These primitively eusocial species can offer an important insight into the early stages of the evolution of eusociality. Two field projects were undertaken during this trip, which studied two species at different distances along the spectrum of sociality. Robin Southon, a 3rd year PhD student was studying the value of males in the primitively eusocial paper wasp Polistes lanio. As we soon came to discover, P. lanio were no connoisseurs of fine nest location, with their preferred habitat being the least pleasant smelling chicken sheds, deserted buildings where dogs come to die and dirt tracks frequented by police with machine guns. Typically, the experiments involved feeding the individually marked males and using video recording equipment to observe how they allocated the food on the nest. At the end of studying each nest, the individuals were collected and preserved for molecular analysis in Bristol. The other project, carried out by Daisy Taylor, a NERC-funded post-doc, was interested in how the plasticity of caste differentiation changes with age in Metapolybia swarm founding wasps – in other words, are older workers on the nest able to change their roles from foraging to brood care if young workers are removed and vice versa; can old workers really become queen if the queens are removed? Ageing these wasps proved to be a challenge, as there is virtually no way to differentiate between a newly emerged and older worker. Thus we had to mark cohorts of wasps with different colours at different time intervals to determine their age. Standing on a ladder jabbing wasps with different coloured marker pens is strangely satisfying, especially when a whole nest of several hundred individuals have been marked. We would then remove different coloured cohorts and made hours of video observations to determine which aged cohorts carried out which tasks on the nests. Again, the experiment culminated in the removal of whole nests and preserving individuals in RNAlater to analyse their gene expression, proteomes and genomes in Bristol, to determine if some kind of ‘genetic switch’ acts to regulate caste determination plasticity. Each project threw up a variety of different unforeseen challenges to frustrate us. The first issue for the Metapolybia study was simply abundance of nests. Although we saw plenty of abandoned nests on the sides of buildings, there were frustratingly few live nests in our locality to study. Unlike the exposed nests of P. lanio, Metapolybia nests are enclosed by an envelope , which must be snipped away to gain access to the cells and individuals inside. Unsurprisingly, removing a large chunk of an organism’s home often upsets them and can cause a variety of behavioural changes, the most extreme of these being nest abandonment. Robin’s challenges centred on the problem of how and what to feed the male wasps. Their natural prey is caterpillars, but searching the grass for enough of the grass-green grubs would have meant we’d still be in Trinidad by Christmas. After Robin’s failed attempt at grow-your-own maggots, which the fussy Lanio would have nothing to do with, we decided the best course of action was to turn to plundering other lanio nests for their larvae and feeding them to distant nests. 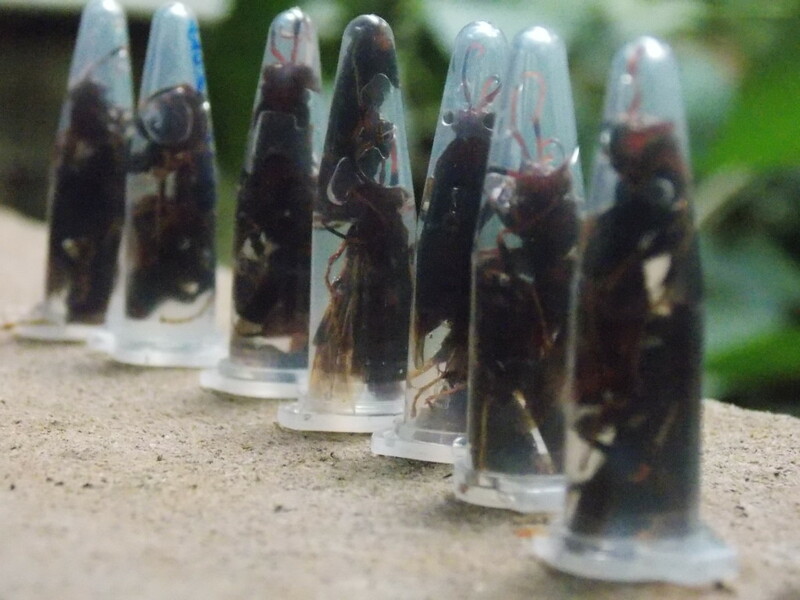 The final hurdle was finding a way in which to take the wasp samples back to the UK. As I have only 600 words here, and not the 6000 required to detail the lengths with which Robin and Daisy went to in order to bring them home, I will leave it at the many hours spent driving around and waiting to meet the relaxed Trini officials. However, apart from the end of my thumb, we managed to return to the UK in one piece and with a demanding, but enjoyable and (hopefully!) successful field season in Trinidad completed.